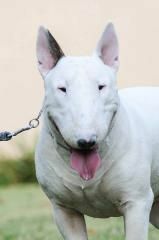 Bull Terriers were bred for fighting until the sport was banned. They are strong, muscular, dogs and need to be kept in check when strange dogs are around as they can be aggressive. The Bull Terrier is normally friendly and affectionate towards people. They have small, egg-shaped heads and a strong neck. The Bull Terrier's intimidating appearance makes him a good watch dog. The coat is short. We sold 2 pups very quick using petsplace website. We are happy with the service received and would like to recommend this site to every serious breeder who wants to sell their pups. 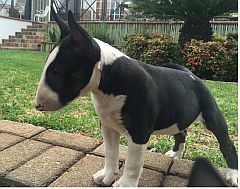 Bull terrier puppies need to bond with their owners and must have a strong Pack Leader. Rules regarding discipline must be agreed on in the family. The puppies will be strong, uncontrollable dogs in a short time, if not trained! Ask your vet about a puppy socialisation class near you. Colour: usually white or brindle. They can be any height or weight but are normally a medium sized dog. 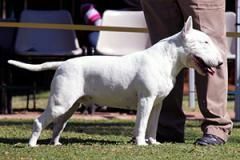 In Afrikaans, the breed is sometimes called varkhond. The bull terrier is the gladiator of the dog world: the mighty warrior! The Bible says "God is a warrior ... who unleashes his burning anger on those who oppose him." Exodus chapter 15. Bull terrier puppies must be socialised while they are young. It's important to establish yourself as the Pack Leader and let the puppy know his place in the pack. He must not be allowed to dominate you or other dogs.